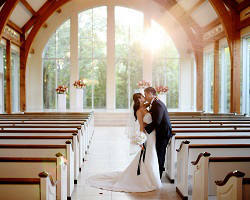 It is not often you learn of a wedding venue in Houston which showcases modern elegance and sets a contemporary trend. Demers Banquet Hall does just that, and has found a way to make it affordable for all brides. Experience paired with flexibility allows Demers to create the perfect setting for an unforgettable event. Savor your wedding night as it transforms from an airy romantic ceremony to a vibrant evening full of music, dancing, and cocktails. Known for their appetizing food and exceptional service, let the Demers executive Chef take your guests on a tasting journey they will never forget. Fifty-Two-Twenty-Six Elm screams modern luxury from its inner-courtyard to the alluring interior spaces. The contemporary architectural structure gives you a feeling of high fashion and style. All this makes the entire experience of walking down the aisle and sharing that special moment with your loved ones all the more memorable. Fifty-Two-Twenty-Six Elm, a chic wedding venue in Houston, provides you with such efficiency and care that you will never forget. Be it indoor or outdoor this event venue will make your dreams come true not only through the warmth of its architecture but also because it’s an amazing and unique wedding venue. Located in North-West Houston, Mia Bella Vita wedding venue is intimately nestled in hundreds of trees on ten acres of land. This establishment has the feel of modern, royal elegance with its splendid Grand Ballroom, sparkling chandeliers, and picturesque garden that creates a setting for a notable wedding ceremony. Mia Bella Vita has 2 outdoor ceremony sites and 1 indoor ceremony area which are all elegantly decorated and allow a steady flow of traffic. The décor of the Mia Bella Vita reception halls would make any photographer’s job as simple as it can possibly be since the venue itself is striking by all standards. Couples looking for the warm and tasteful wedding with a classy party hall would be advised to search no further. Giving you the grandeur, dazzling wedding you deserve, The Bell Tower on 34th Street is the perfect event venue that is also one of the most sought after in Houston. The Bell Tower on 34th Street is suitable for both indoor and outdoor weddings, and boasts an outdoor courtyard with an unimaginable water wall which illuminates the evening in various colors. The chapel and ballrooms all evoke a feeling of being inside majestic Italian villas and plush haciendas. The rich stone columns, arches, and gorgeous verandas of The Bell Tower on 34th Street promise you an elegant, exquisite wedding that is likely to stay etched in yours, as well as your guests’ memories for a very long time. A fully customizable menu, mouthwatering chocolate fountains, and a vast array of wedding decor make this venue a one stop shop. The Spanish inspired architecture and décor brings warmth and romance to every couple that chooses to say there I do’s at The Gardens Houston. Striking a cord with even the most fashionable brides, Ashton Gardens offers an event venue that will take a brides breathe away with just one glance. They provide exclusive services for individuals getting ready experience one of the most special moment of their lives. To aid in the logistics, highly skilled event coordinators guide the happy couples to insure a stress free wedding day. Centrally located in the Westchase area of Houston, Pelazzio is matchless in its Supreme Catering & First-Rate Personnel Service. They have assembled the Ultimate Team of Award-Winning Culinary Professionals, Certified Wedding Specialists, Event Planners and additional Supporting Staff; all of which work tirelessly to assist in creating a celebration as distinctive & remarkable as each and every one of You. Pelazzio Reception Venue’s newly renovated exterior houses four alluring ballrooms, which have the ability to host intimate events with guest lists of 100 or less up to grandiose celebrations of 550 guests. The Tuscany Ballroom features brilliant crystal chandeliers in every room while the Grand Ballroom prides itself for its antique chandeliers, beautifully-lit staircase and high ceilings adorned with elegant chiffon drapery.